LEAF COLLECTION UPDATE: We will complete one full round of leaf pickup on January 2, 2019. 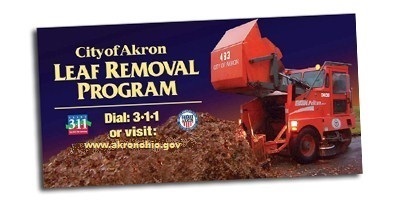 If you still have additional leaves needing picked up, please rake your leaves to the curb NOT INTO THE STREET and call 311 to receive service before January 18, 2019. Thank you for participating and helping make this leaf season a success. SPECIAL NOTE: You can choose to rake your leaves to the curb or bag them using environmentally-friendly, biodegradable paper leaf bags. If you chose to use biodegradable bags, they must be set out on your scheduled leaf pick up day. These bags are available at many local stores. With either option, the same pickup schedule will be followed. Our Service is more efficient and economical to the resident if these guidelines are followed. DO NOT allow children to play in leaves on or near the street. DO NOT rake leaves into the street after leaves have been removed from your street or you will be subject to a fine. DO NOT park vehicles on the street the day before your scheduled pick-up, until your leaves have been removed. DO NOT park vehicles over leaves. The heat from the underside of the vehicle may cause a fire. DO rake leaves into the street, no more than two feet from the curb or street edge, the day before your scheduled pick up day.